Browse content similar to Series 3 Reversions. Check below for episodes and series from the same categories and more! Anita Manning and Mark Stacey start their journey in Aberfeldy. 'Bluebell' the Morris Minor breaks down. Two experts finish in Richmond, North Yorkshire - two more start in Aboyne. Tactical shenanigans from rivals Philip Serrell and Catherine Southon. The competition culminates in an intense auction showdown in Liverpool. Thomas Plant and Paul Laidlaw travel from Skipton to Sheffield. Thomas Plant and Paul Laidlaw hit the shops between Huntingdon to Towcester. Thomas Plant and Paul Laidlaw face the final auction showdown in Pewsey. Charlie Ross and Charles Hanson drive from Scunthorpe to Grantham. Charles Hanson and Charlie Ross travel from Lavenham in Suffolk to Greenwich. Seasoned auctioneers James Braxton and Jonathan Pratt travel from Altrincham to Nantwich. 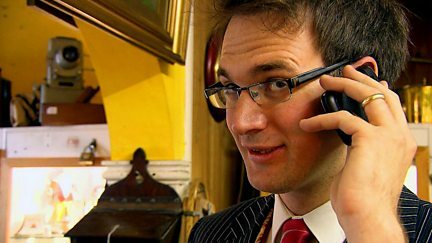 James Braxton and Jonathan Pratt kick off their quest for antiques in Stratford-upon-Avon. James Braxton and Jonathan Pratt head for their final auction in Lostwithiel, Cornwall. David Barby and David Harper continue their antiques trail, starting in Athlone. David Barby and David Harper shop in Aberystwyth for items to take to auction.